Blue super giants are stars that are too bright and too big. 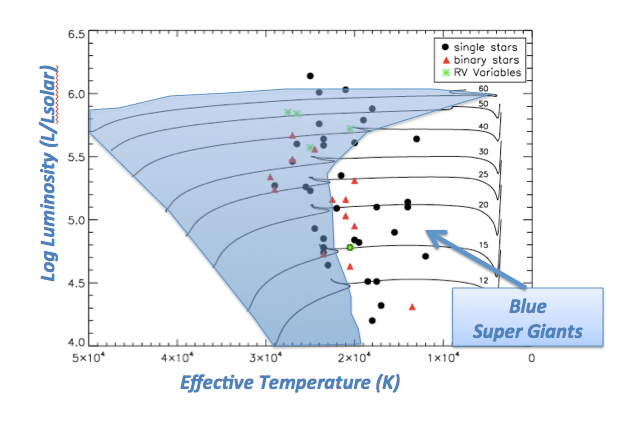 Stellar models predict that they should be very rare and yet we find many of them. We don’t know if they are regular main sequence stars burning hydrogen, whether they are in the helium burning phase or whether they are on verge of exploding…. the progenitor of supernova 1987a was a blue supergiant. In this paper lead by Catherine McEnvoy and Philip Dufton (Belfast) we investigate the properties of blue super giants in the Tarantula survey. Never before we had such a well studied set of these stars. From this sample we learn that we have under estimated how big and cool massive stars get on the main sequence. An extension down to 20,000 K is suggested. This Hubble Space Telescope Treasury program is imaging 50 nearby galaxies in full color resolving many of their stars, star clusters and associations. Science goals: (1) quantify how the clustering of star formation evolves both in space and time, (2) discriminate among models of star cluster evolution, (3) investigate the effects of starformation history on the UV starfornation rate calibrations, (4) explore the impacts of environment on star formation and cluster evolution across the full range of galactic and ISM properties, (5) investigate UV-excess globular clusters across multiple environments, (6) study the environment surrounding supernovae. Description of the survey (Calzetti et al. 2014 accepted for publ. in AJ). Link to LEGUS website. Growing evidence for the existence of very massive stars (up to 500 Solar Masses) motivated the development of corresponding stellar evolution models accounting for a wide range of rotation rates (0 to 550 km/s), masses (from 70 to 500 M⊙), LMC composition covering the hydrogen burning phase. In Kohler et al. we discuss the many peculiar phenomena, homogenous evolution, inflation, mass loss. We find that mass loss and spin down prevents the formation of pair instability supernovae and long gamma-ray burst, for these high masses. Welcome to all new group members of the BinCosmos project group. 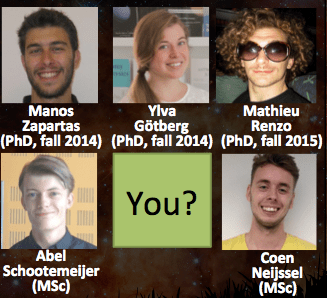 If you are interested in applying for a postdoctoral fellowship and work with us (Marie Curie or Veni = Eu/Dutch “Hubble Fellowship equivalent”) please check the jobs page and contact me. For Dutch students who want to do BSc or MSc thesis project, please also contact me. Just spent a night at Mount Palomar Observatory at the 200 inch (5.1 meter) telescope. Quite amazing that this mountain, just 2.5 hours from Los Angeles, is the location of the telescope, which used to be the most important telescope for about 4 decades until 1992. I joined a team lead by Ben Oppenheimer (American Museum of National History) that build a special instrument that can not only detect planets (which is very challenging because it is sitting right next to a very bright star) but also get some information about the properties of the planet through its spectrum (which is even more challenging to get). The museum made a very nice short video explaining how this works: “Seeing planets like never before”. Unfortunately, the weather was not very good: it was clear, but the strong winds made the air too turbulent. So, no new discoveries tonight, but for me a very useful and special experience. 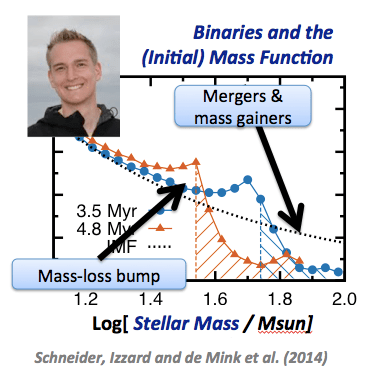 New Paper: How many massive stars are product of a binary merger? 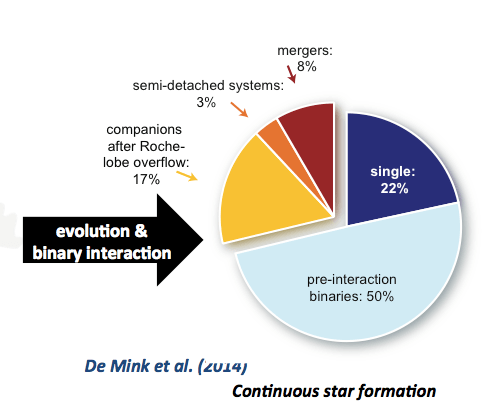 Incidence of mergers and other products among a typical population of massive stars. A merger between two stars may sound like an exotic event, but for massive stars this is not rare at all. About a quarter has a companion that is so close that the two stars will coalesce to form a new rejuvenated star (Sana, de Mink et al. Science 2012). In this paper we simulate the evolution of the stars and their interaction processes. We predict the incidence of stellar mergers and other products of binary evolution among a typical stellar population. Furthermore we show that these products typically appear to be single stars. 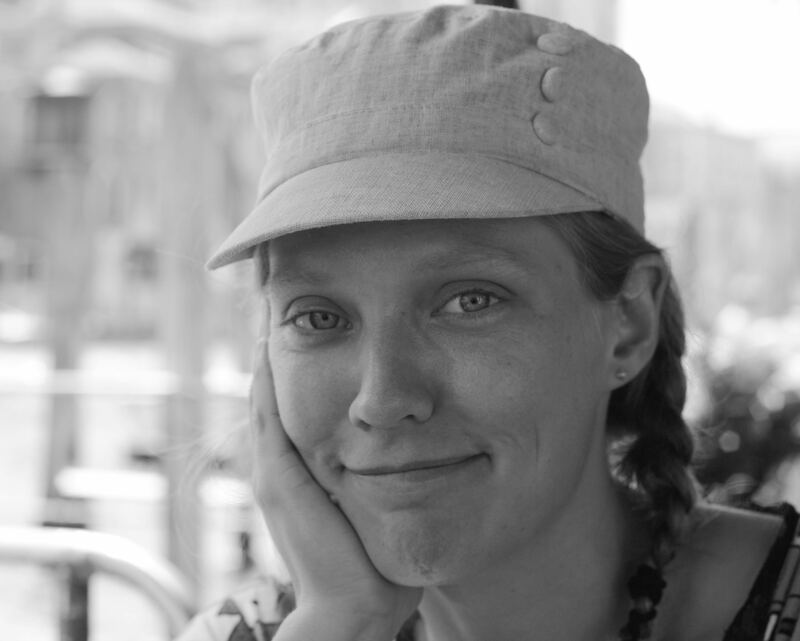 Published in Astrophysical Journal, De Mink et al. (2014). Today the first data of my very first own Hubble proposal is coming in. I feel excited as a child. Especially since I am from the generation that grew up as children with pictures from Hubble. And now, finally the first data is coming in. Still unprocessed and it is not yet clear how good the data is, but it looks so pretty already.